Full Service menus, Cutting Edge Catering, Catering to your every Whim! Serving Joilet and the entire Chicagoland area! Designed for you to sit back, relax & enjoy. We will take care of it all! Colored Linen Tablecloths are available - pricing is based on size & color. 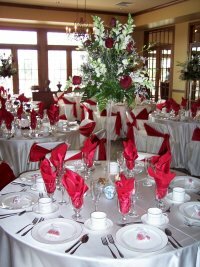 Chair Covers with Sash are $4.25, plus $100.00 Delivery & Pick Up Fee. If you were to choose Plate or Family Style: Our Friendly Staff will provide the meal directly to your guest tables. Buffet tables, guest tables & prep tables are provided by the customer/location or you may rent them through us. 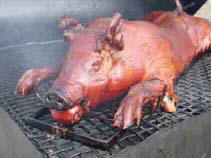 Depending upon the location - Prices are subject to Caterer Usage Fees and/or Service Charges. A white linen tablecloth and a white skirt on three sides of the table. This package can be used for your Head, Cake, Gift, Reception, Place Card, or DJ Tables. Service Package pricing may vary depending upon the complexity of the event site for labor and equipment. For Events at the Rialto Square Theatre please add $1.00 per person service fee. the Barber & Oberwortmann Horticultural Center, and the George’s 174. • All Menus & Pricing are subject to: change without notice, delivery, minimums, applicable sales tax, caterer usage fees, service charges and menu items are subject to change without notice depending on market availability. • Prices are per person based, unless noted otherwise. Based on a minimum of 75 people and tables of 10 people. Add $1.00 for tables of 8 people. - Call for Details on Smaller Sized Events. • Caterer Usage Fees & Service Charges: Varies depending upon the event location. The Rialto Square Theatre has a $1.00 per person Caterer Usage Fee. • Final Counts are due five (5) business days prior to your event date. • Deposits: $300 - $1000 deposit and signed contract is required to secure the event date. • Our Exclusive Locations: The Barber & Oberwortmann Horticultural Center & The George A. Perinar Memorial Hall each have their own brochure custom tailored for that specific location. Ask for their Brochures. • Other Brochures: Corporate & Social Events Menu is designed for a more casual affair with optional Staffing Packages. It might give you some other options/ideas. We have a CD & ME Menu that is custom tailored for that specific location. Action Stations are available also. Ask for their Brochures.